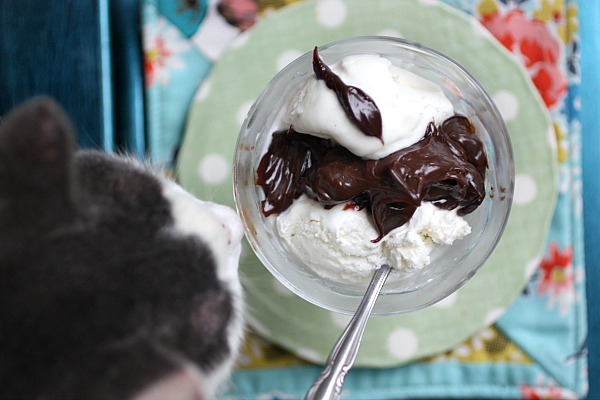 I admit, sharing this easy Homemade Hot Fudge sauce recipe is a gift to chocolate lovers everywhere. Can you imagine receiving this as a gift “just because?” Oh my!! To take it up even a notch further, add a touch of Kahlua for your adult gatherings. These are the kinds of sauces in which people pay gourmet speciality store prices, but when it’s homemade, we indulge for pennies on the dollar. Trust me! With holidays right around the corner, this makes a perfect hostess gift. Who wouldn’t be delighted to receive this. I should have taken the time to drizzle this all pretty like, but I really just planned on eating it, not photographing it. Halfway through, I knew I needed to share. 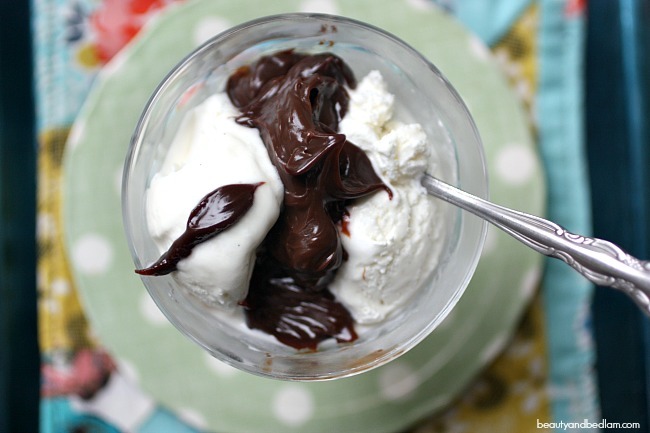 Summary: Sharing this homemade hot fudge sauce is a gift to chocolate lovers everywhere. Decadent and delicious. Place the chocolate and butter in a microwave safe bowl. Microwave on high for 30 seconds. Stir. Repeat the process until the mixture is melted. In a small saucepan, bring the water to a boil. Stir the melted chocolate mixture into the water. Add the sugar, corn syrup, and salt into the pan. Stir until combined. Raise the heat to high to bring the mixture to a boil. Once it’s boiling, turn it back down to a simmer. Stir through this entire process. Cook for nine minutes, stirring regularly. Remove from heat, and allow it to cool for 15 minutes. Stir in any flavorings if desired. 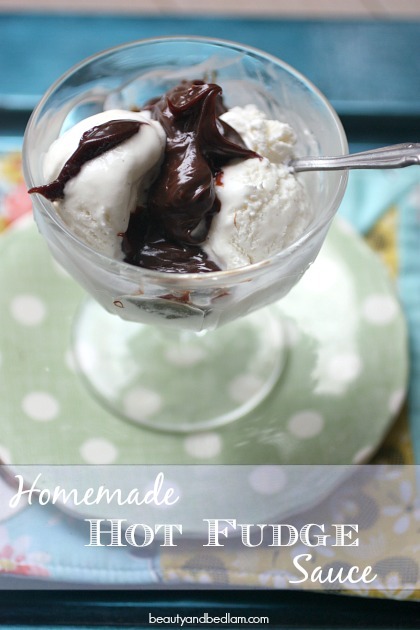 I make my own chocolate syrup for chocolate milk and hot chocolate, but haven’t tried making hot fudge…yet! I think I will have to give it a try. It looks delicious! And you’re right. What chocolate lover (like myself) wouldn’t love this?